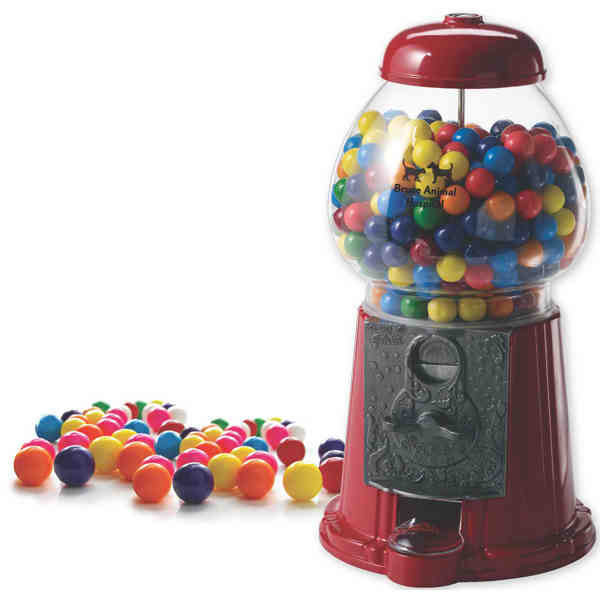 Product Option: Without gum - Take a trip down memory lane with our gumball machine. A great way to attract attention in your lobby or reception area, this dispenser stands 11" high and is made with solid antique cast aluminum with a glass bowl that holds 24 oz. of gum. A one color imprint is available, so brand this item with your company name or logo. Candy is included. Contents are packaged separately to prevent breakage during shipping. Candies are packaged separately to prevent breakage during shipping. Kosher certification available. Size: 11 " x 6 "
Imprint Size:2" x 1 5/8"